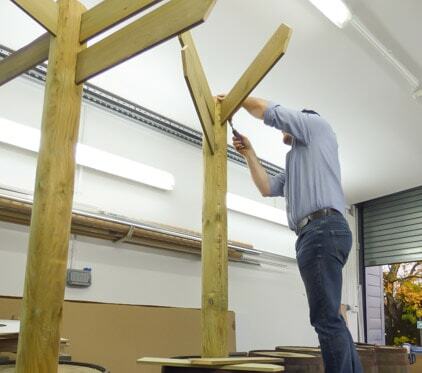 If it’s happening at The Voodoo DesignWorks in Bristol and Nationally – it’s all here in our news. 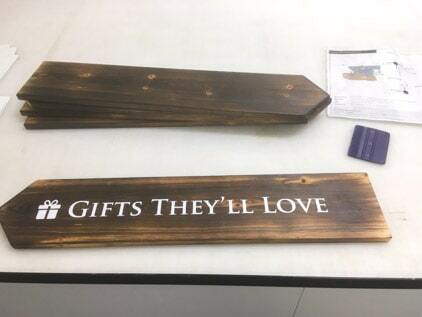 Voodoo designs, manufactures and installs signs for clients in Bristol and nationally. We deliver top-fuel creative ideas to design agencies. We work in all sectors of commerce and industry. Our wide ranging work means that what Voodoo reports, is interesting news. If you’re looking for ideas and think Voodoo is in your future, our news will show you what’s happened in our recent past. Voodoo is an ideas and creativity-led company. If you read about the solutions we’ve proposed and delivered to others, you’ll perhaps be inspired to ask what we can do for you. If ideas and creativity are your business too, come to Voodoo and we’ll find practical ways of turning your vision into a practical and affordable reality. If you run an agency and If ideas and creativity are your business too, come to Voodoo and we’ll find practical ways of turning your vision into a practical and affordable reality. Get your sign projects and creative ideas out of your head, and into Voodoo. Calling us will not only leave you the head-space you need to get other things done, it’ll immediately see your ideas met with commitment and interest rather than blank looks. 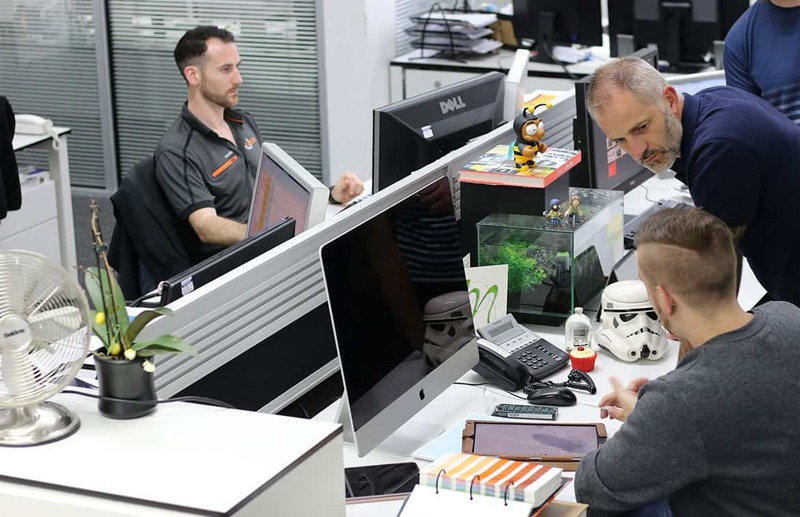 Here at Voodoo, we have strong formal project management skills that surround and support everything we do. It’s a well-honed system that takes as its input sparks of creative ideas and produces as its output real-world deliverables that meet the need of customers of all shapes and sizes. What would Voodoo come up with? You’ll never know unless you ask us. Here at Voodoo, we’ll work with nothing more than an idea delivered on the back of a napkin. If that sounds like hard work, meet with us and talk it over instead. We’ll work with fully developed designs and rigidly enforced corporate ID too. If you’re sat somewhere between the two – you should call Voodoo as well. We’re first port of call for lots of companies looking for signs. That said, we’re there at the table with retail establishments who’re all about customers experiences these days and want us to help provide them. Schools come to Voodoo for wall graphics. And those who’re responsible for all kinds of public spaces and places and who want to find way of customising the environment have us do the job too. You’ll also find Voodoo way out in left field where the real edgy leading-edge creative stuff is watered and grown. That’s because we tend to find a way where others may have found a way to say no. Give Voodoo a try and we’ll get your project moving. We’re all about processes. We have to be. We manage huge projects right down to the tiniest of the details that they comprise. Where we differ is that we’ve managed to define systems that see process in the pure sense, mesh its gears with creativity at its wildest and yet still get along. A conversation with Voodoo therefore keeps everyone happy. Wildfire ideas are fanned – Jobs get done. A new year is just around the corner. Why not call Voodoo about your signing, branding and promotional needs now? We’ll get you out of the traps and running as soon as 2019 gets into its stride. Ideas meet action at Voodoo. How about yours? Windows are amazing things. They let the light in and keep the wind and weather out. People inside can see out and those outside can see in. With a bit of basic work, windows can be worked on to achieve privacy and yet still leave a comfortable environment for those inside. 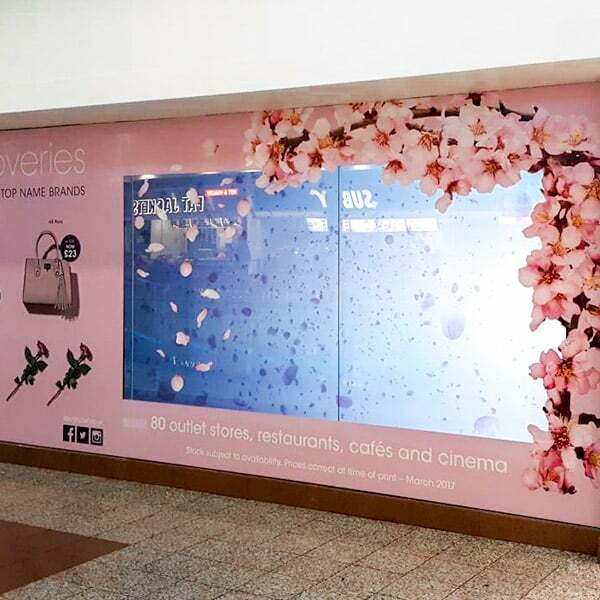 Windows can have graphics adhered to them too so that they function as really effective promotional advertisements or signs facing the street. 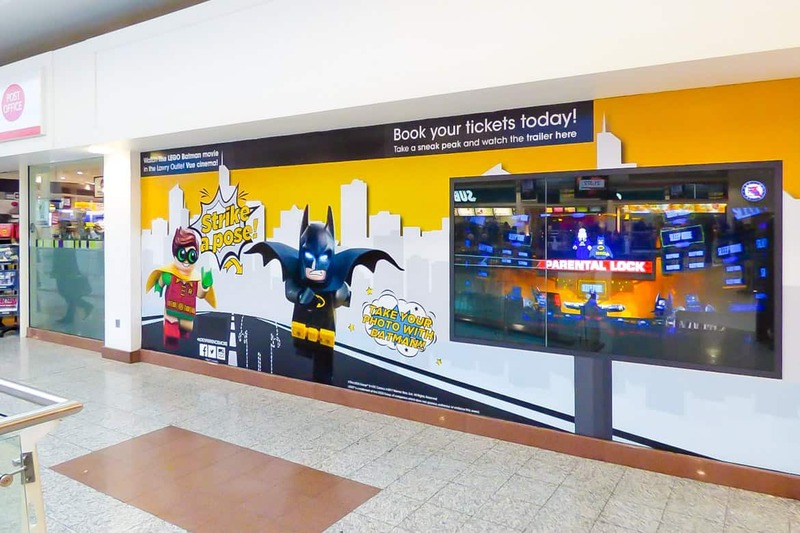 You can even have graphics that don’t obstruct the view out for those indoors. We’ve been experimenting in taking windows a bit further still though. We’re turning them into digital displays. It’s neither disruptive or particularly costly to do. It can be temporary or more permanent. It’s undeniably effective and really does get attention. Why would you turn a window into a screen? Think about that for a moment. You could, if you choose, have your ‘screen’ display vivid, animated content to the outside world. That would stop people in their tracks. You could display information, prices and special offers for example. What would movement and colour add to that? You could display advertising, special content for any occasion or event. Powerful stuff. How does it work? Brilliantly! We have access to some rather remarkable materials. They have an adhesive on one side and on the other they have a coating or special texture that disrupts light in just the way we want it. We apply the material to the inside of the window we want to turn into a screen so the content will be visible from the outside – day or night. We can give the whole window the treatment. We can cut the material to shape, a logo for example. 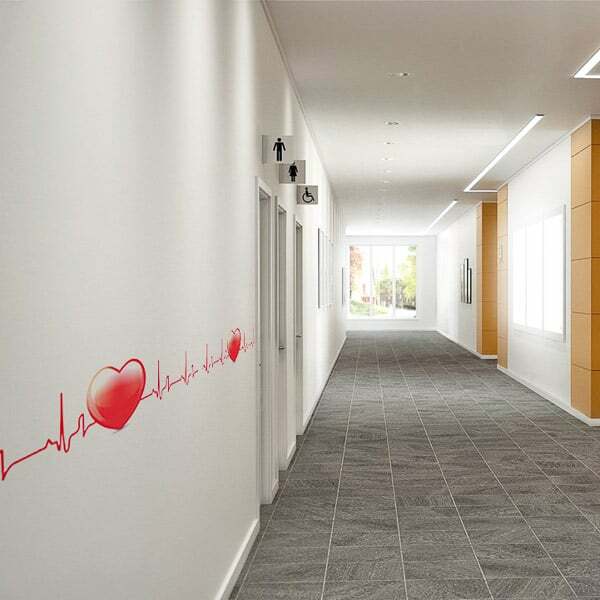 We can use the material selectively within a printed or cut and applied graphic too. Next we see about getting images onto the material. That involves a projector. For most applications, the projector is situated inside the premises to which we’ve applied the screen rather than outside. We can specify what are known as ‘ultra short-throw’ units. These can be situated only inches away from the screen and below the area we want to project upon. That means nothing can get between the screen and the projector and there are no ‘hotspots’ on the displayed image. Once we’re set up, it’s all about content. We’ve done some amazing jobs with this technique. We turned a picture of a bill-board in a printed graphic into a live screen. We’ve had animated snow falling. We’ve even explored making passers-by the stars. For once, this really is an application that’s only limited by the imagination. We’re all ears if you think you have an application for turning any window into a digital screen. It costs nothing at all to call us and discuss your idea. We can produce a prototype to try your idea – we may even have one already. ’Tis the season. 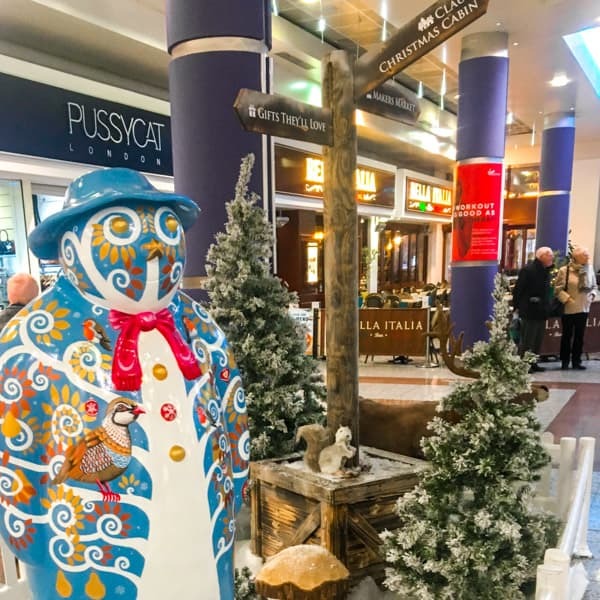 And that means all manner of seasonal and temporary attractions are going to spring up in shopping centres, and that thousands of shoppers are going to descend upon them. 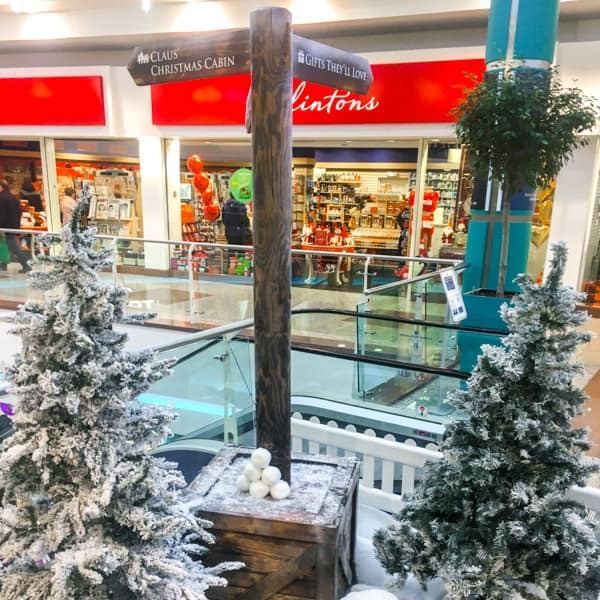 Making sure that each and every shopper can find what they’ve come to see, means temporary signs pointing the way. Voodoo is no stranger to wayfinding signs, or designing and installing them. 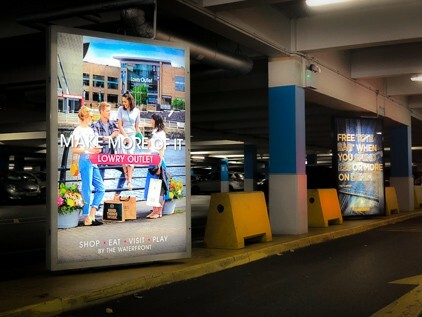 On this occasion though, our client, Gloucester Quays, wanted something a little different than sign-systems as usual. A bit of head-scratching and a few ‘phone calls and we were on our way. We knew it had to be rustic. It had to be very obvious. It had to be eye-catching too. The Voodoo solution was a ‘system’ fabricated entirely from wooden components. The signs’ footings are barrels – whiskey barrels to be exact. We have some great talent aboard the good ship Voodoo but there isn’t a cooper in our midst. So, we did what any self respecting creative collective would do and we found the barrels we wanted and shook hands on a deal to make them ours. Next up, posts. Posts are simple and that’s what these proved to be. 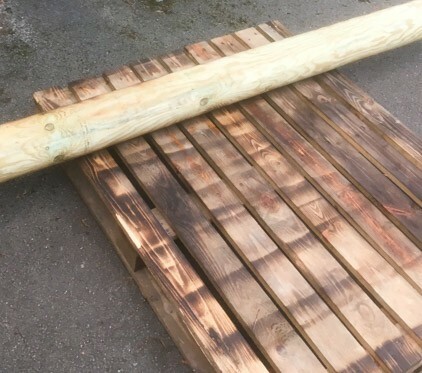 We found some nice, straight, treated timber posts, round in section, with the right kind of knotting and markings and we dragged them back to The ‘Works. Finger panels to mount to the posts and which would point the way to our client’s destinations were next. 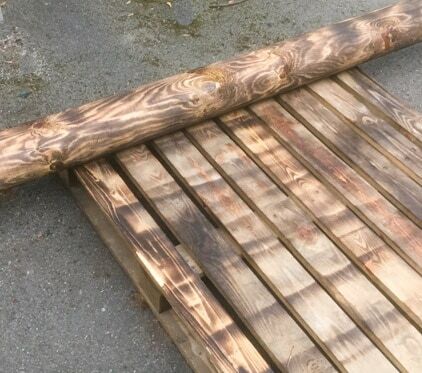 That meant finding some wood that fitted with the general look and feel of our other components which, to be fair, wasn’t hard to do. The hard bit was yet to come. We were going to use our big Tekcel router to mill the slots required into the signs’ finger panels and then fit them to the posts. Problems was, the chunky posts didn’t actually fit under the router gantry. Too big! Oh no. We’d have to do it by hand. We’re fortunate in having James work for Voodoo. James is our senior estimator, project manager and something of a signage guru. There’s little that happens in or around Voodoo that James doesn’t have some present or past experience with and, it turns out, he’s pretty handy with a wood chisel. 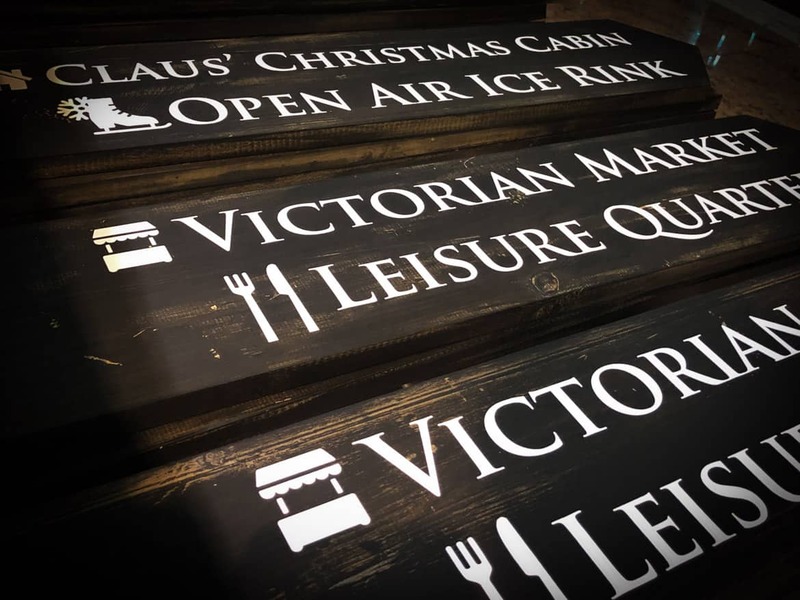 Once James had done his chipping and chopping stuff, our shaped and lettered panels were inserted into the posts and they look great. Not too precise. Not too sloppy. Just right. 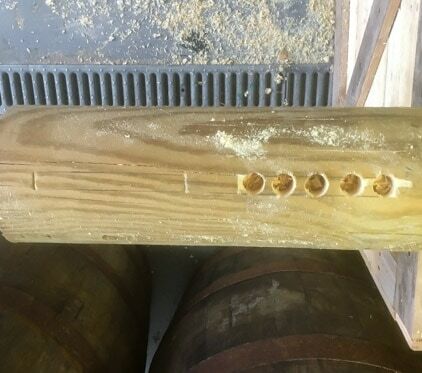 Fitting the posts into the barrels was not that challenging. 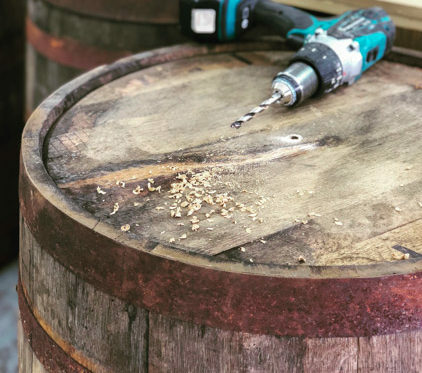 We just had to cut holes in the tops of the barrels and the rest followed. With all the signs assembled we set them out in the Voodoo car park for a photo shoot. James had managed to find himself a very large blow torch and was, indeed, trying to set fire to the signs we were about to photograph. 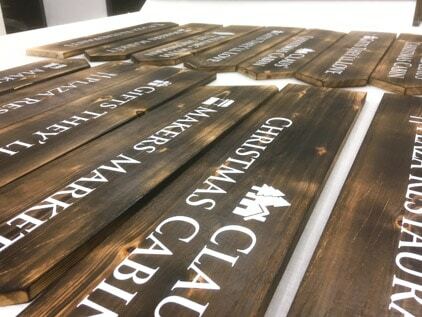 Turns out though, it was the finishing touches being applied to give the rustic wayfinding signs the ultimate in rustics finishes. Count on Voodoo to get it right. 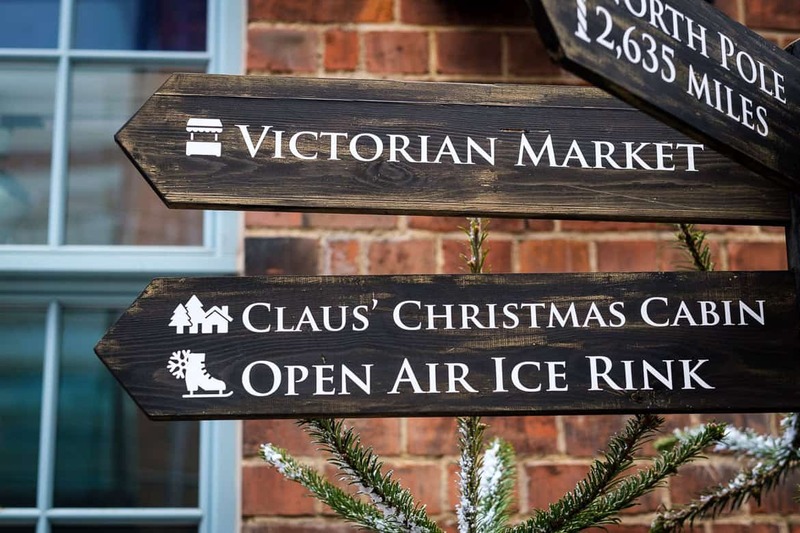 These signs don’t just look rustic – they smell rustic too. Crisp, cut and applied lettering in white complete the ensemble and recognises that signs, no matter what the design intent, have to be legible. The applied lettering contrasts nicely with the scorched background so that’s another tick in the box this unusual wayfinding system scores. Our client is pretty happy with the result and we are too. Just goes to show that great things are possible with the right materials and a bit of creative energy pointed in the right direction. Thanks to James, the signs are pointed in the right direction too. You don’t have to put up with the view out of that window or inflict it on your customers and visitors. Window murals from Voodoo are the answer. The question is, where do you need yours? 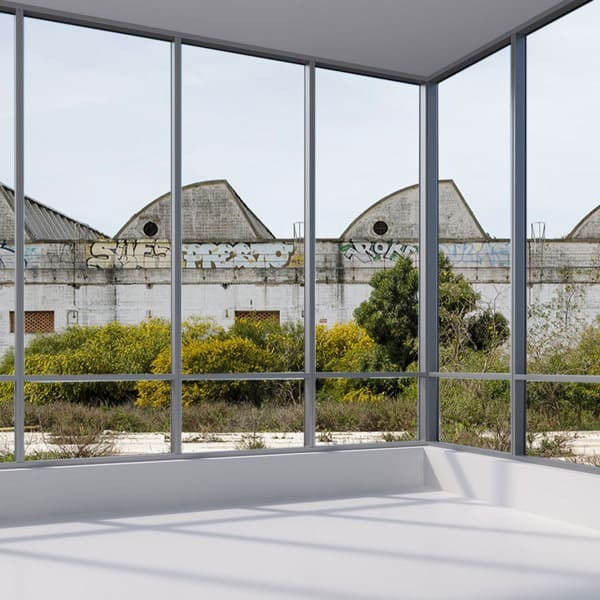 If you have a window, or several for that matter, that are either overlooked, or themselves overlook a view you’d rather wasn’t there, we have the answer. 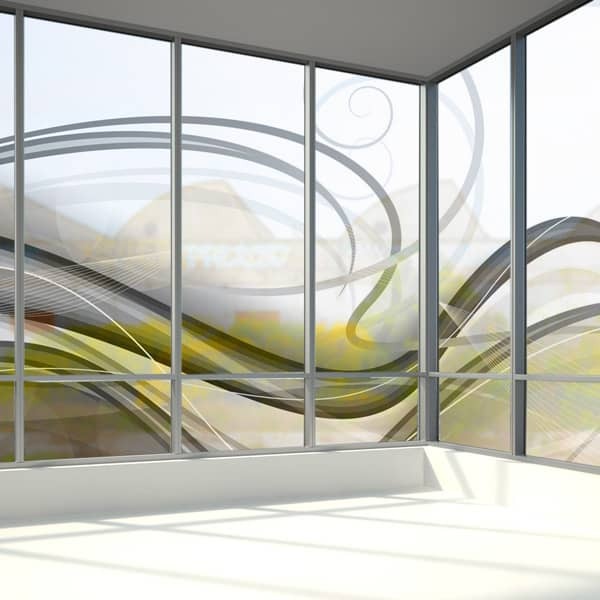 We can custom design a printed and applied window mural that changes the view totally, and that still lets your window function as a mean of admitting light while giving you privacy too. Here’s how it works. We print a design that we’d agree with you. Anything’s possible. If you want a view over the Pyrenees from a city centre you can have it. If you want the view out to be of a forest interior, just ask. If you’d like to gaze upon an otherworldly vista of a completely different planet, you’ve got it. We use a special material that adheres to your window and lets a good amount of prevailing light in while obscuring the view out with your design. The impact is nothing less than stunning. The cost is most definitely affordable. The problem is solved with something very attractive and one hundred percent functional. So if you have a view that you’d rather wasn’t there, your next move isn’t to new premises – it’s to call Voodoo. We can sort it in no time at all. 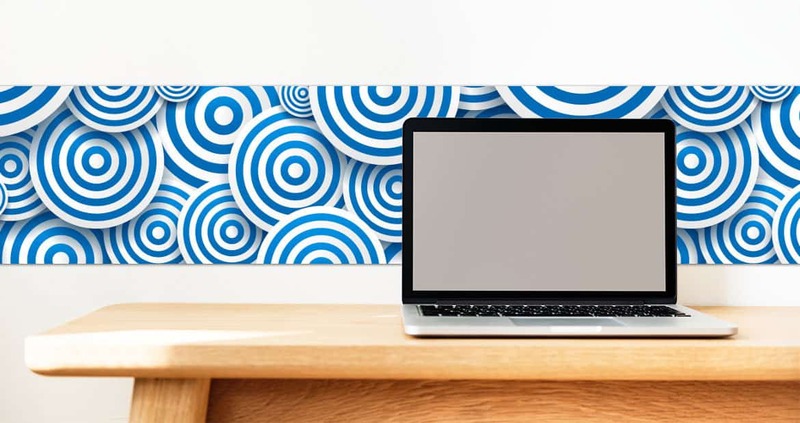 Just like a little seasoning can enliven a bland dish, a printed frieze from Voodoo can help you transform dull spaces in next-to-no-time and at low cost. We can create any design you can imagine or you can leave it to us if imagining is not your thing. We supply your frieze ready to install without any paste, water or inconveniences, and it that’s not your thing either you can leave installation to us too. A frieze can be purely decorative. It can be functional, serving the need of a wayfinding sign. It can be, more or less anything you want it to be. 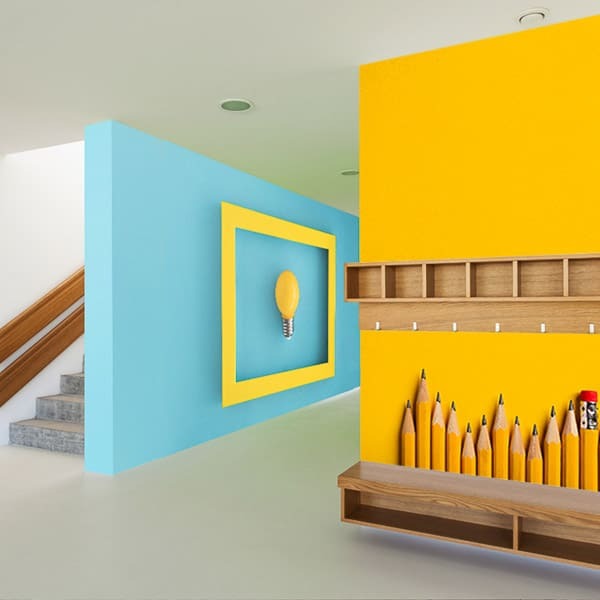 You don’t have to put up with dull spaces or commit to a huge decorating project. A frieze or border from Voodoo is the inexpensive way to transform a lot, while spending a little. Give us a call to discuss your needs. We’re here to help and a conversation costs nothing. 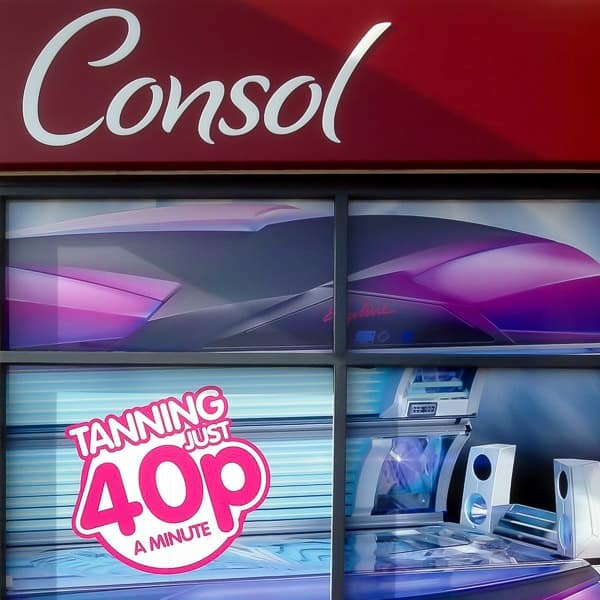 Consol operates a nation-wide network of tanning salons and has a very distinctive identity promoting them. Providing the network with signing is a job that falls to Voodoo. We work with the Consol ID and develop state-of-the-art energy efficient facia signage for the company’s premises. No two jobs are the same and we never quite know what we’re going to encounter when Consol’s continuing expansion meets the need for a new sign. We may have an existing fascia to replace. We may be required to ‘slot in’ to surrounding architecture and work with specified materials such as glass or aluminium composite. We may have to consider structural elements adjacent to other premises. Put simply, we have to be ready for almost anything. Here at Voodoo, we are ready for whatever comes our way. That’s how we keep performing, not just for Consol but for other clients with their own needs and demands. Consol’s salons look great and look ‘Consol’ wherever they operate. That’s thanks to our creative and sign engineering expertise finding a way. Voodoo could find a way for your branding and signage programme too. A conversation with us costs nothing and you’ll see we’re not short of ideas. We’re not found wanting when it comes to execution either. Give us a call – find out what Voodoo could do for you and your brand. There are some very clever materials out there. Among them is a backlit transparency film we’re quite taken with. It does a stunning job when we load it into our HP Latex wide format printer and get the ideas and colours flowing. Material goes in, superb posters, ready to be put into backlit frames come out. 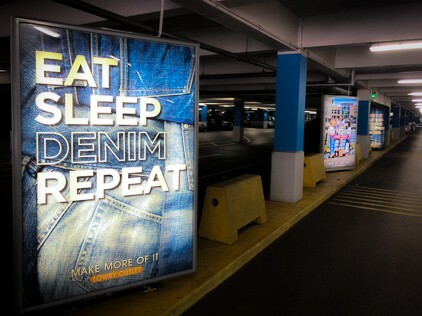 These posters look great in daylight conditions and continue to work hard when the lights go out too. They don’t look washed out like backlit paper prints might. And they have a quality feel about them that tells you they’re going to last. 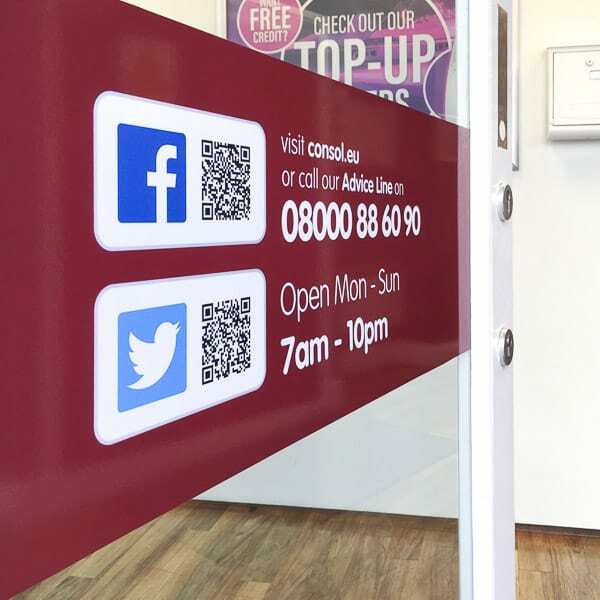 We won’t presume to tell you where you can use our backlit posters. Suffice to say they work anywhere that printed paper ones might and in thousands of places where they don’t. 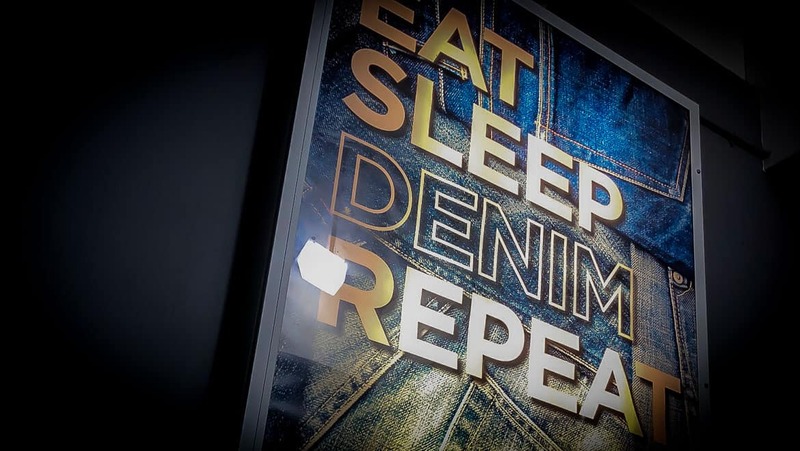 We can supply posters ready to fit existing lit frame systems. Or we can supply frames too if you’re lacking one. They’re great for menus, window point of sale promotions, event advertising and more. Give us a call and we’ll turn the lights on and walk you through the full range of applications. Maybe you have ideas of your own – we’d love to hear those too. In terms of uncharted space where graphics are concerned, floors are right up there. You do see a floor graphic here and there, and, if we get our way you’ll see a lot more of them. That’s because they work and because our customers look to us for solutions that deliver. Some “floors” are a bit more “graphics ready” than others. Tiled flooring indoors = easy. Expanses of grass outdoors = not quite so straightforwards. We’re Voodoo though – no challenge resisted. 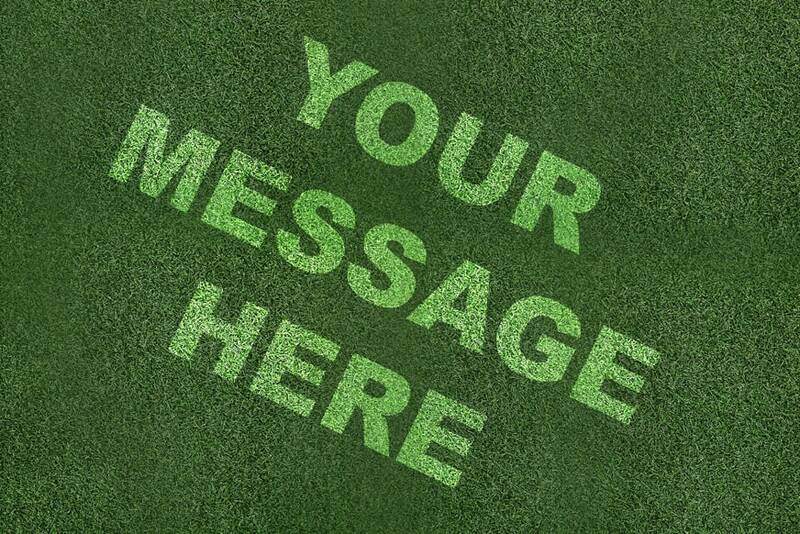 Clearly, you can’t easily stick printed materials to grass. Rip it up and there goes the lawn for six months while it recovers. That leads us gently by the hand to specialist paints. The sort of paints that are used to mark out pitches, courts and other sports surfaces. Add a bit of Voodoo to that formula and you have a grassy graphic. Getting the paint down in a controlled manner is the next challenge and doing it repeatably and at scale winds up the difficulty knob a bit further still. We overcome though – with imaginatively created and colour coded stencils. 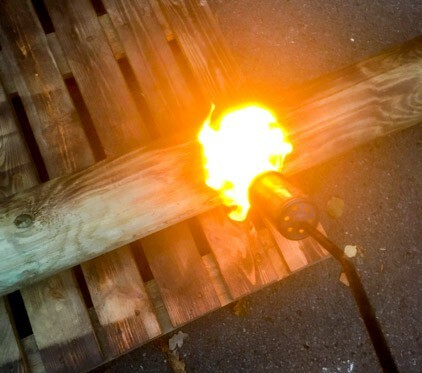 We take some known materials and we cut and assembly them to form a stencil. Peg it out under a bit of tension and paint through the apertures presented in the prescribed colour. Unpeg and remove the stencil and there’s your grassy graphic. It washes away eventually, or grows out over time, so no permanent evidence of your temporary graphics remains. Pick up the phone to Voodoo and we’ll happily make the journey on to your turf if you think this is an idea you’d like to play with. The stencil will work time and again so it’s going to be a very cost effective solution. I K Brunel would have looked out over a very different skyline in his day than the one observed today through a window close to his magnificent steam ship, the SS Great Britain. 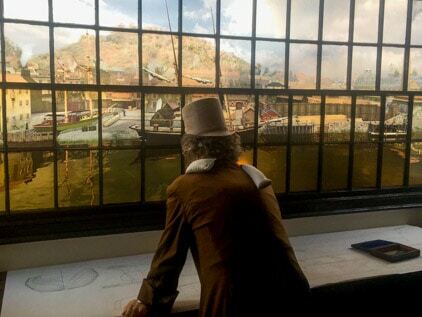 We were invited to deliver a solution that effectively erased today’s Bristol from view and which replaced it with a vista in keeping with the SS Great Britain’s era. We produced a novel window graphic which has exceeded expectations. We worked with a high definition composite depicting the view from the vantage point where our rather special window graphic would be applied. We then set about finding a suitable material for the job that would achieve the effect we were looking for and which would perform its job well in resolving the incredible detail in the digital composite we were asked to work with. 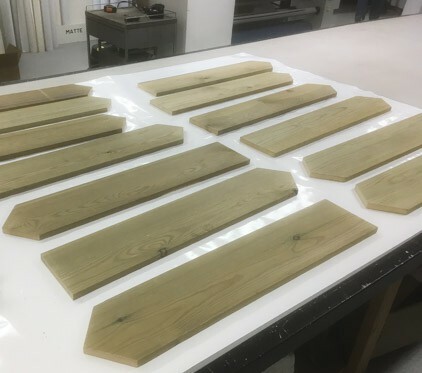 After making and rejecting a number of prototypes produced using window materials we’ve turned to in the past, we settled on one that had a particularly attractive quality in this application. Its liner, a glassine paper, imparted an obscuring quality in the adhesive that, once the material was applied to glass, still allowed the quality of light prevailing outside to filter into the space behind. It works superbly. 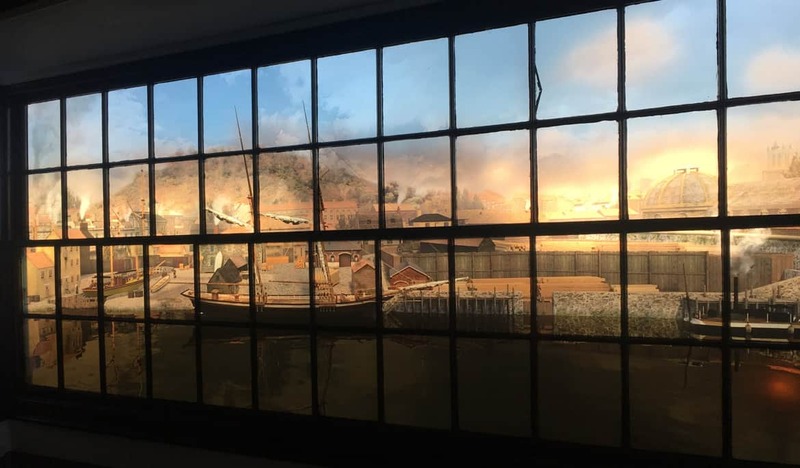 Once our printed graphic was applied, the view to the modern city of Bristol was effectively erased and replaced with one reflecting the SS Great Britain’s period instead. The graphics picks up lighting cues from the exterior that are reflected in the graphics itself. On sunny days, the print’s character is totally different to that presented when the weather is changeable or raining. 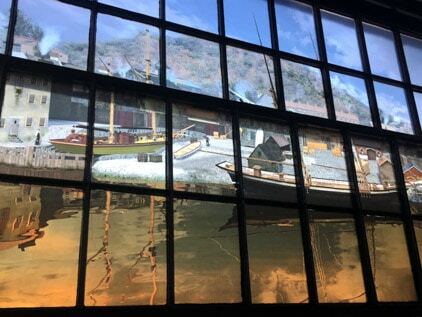 Now when visitors to the SS Great Britain look toward the window, they see what the great man himself might have seen in his day. It all contributes to a wonderful and very atmospheric display. If you’re in Bristol, do check it out. Check us out too. 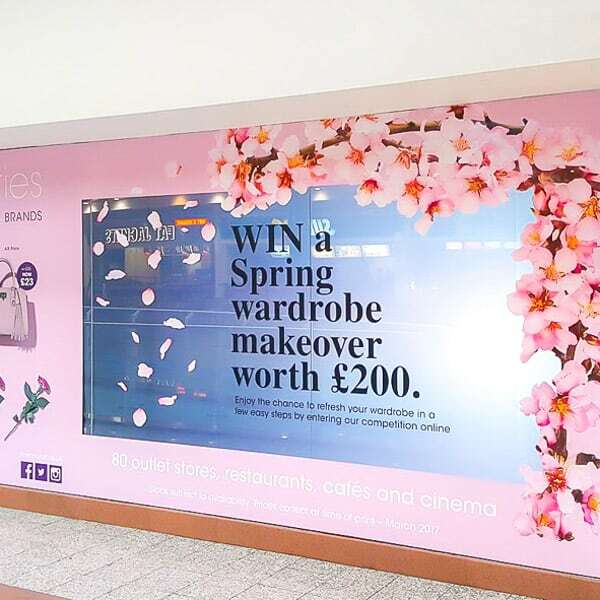 We understand how to leverage graphics for winning experiential effect and we’d be delighted to put our expertise with print, design and projection technologies among others to work for you and your project.